If you’ve ever lost weight – extreme or not – there’s always the fear that you may revert back to your original size. That even if you’ve been practicing habits for years that you will wake up one day and magically lose them. As someone who was obese that fear is in the back of my head many days. Do I think it will always be there? Of course not, but that will also come with years of practicing self trust. It will come with distance and time away from the life that was weight loss and competing. When I think about the time of my life that I was overweight or obese, it was only roughly 10% of my life. Isn’t that crazy? Something that lasted for a short period felt longer. it felt like a lifetime and I remember when I started that I felt like it may never end. It took almost 16% of my life to get to where I am. So that’s 26% focused on figuring out what healthier meant for me and what fitness or health goals were. Remember I’m only 28. I say often that I haven’t lost weight for health since last year. When I competed in my first season it wasn’t about health, even though the fat loss was helpful for my health, it was for the stage, it was for pushing myself out of my comfort zone. Twenty-four pounds gone. When I competed in my second show it wasn’t for health it was for the stage, it was to be better than the last time and to prove to others that I could do it and that I could have a piece of that lifestyle. I had already proved it to myself once, but others needed convincing. Another 20 pounds gone. This last season, this was for me. I wanted to qualify for Nationals, I didn’t want to go because I’m not stupid – I do know that my body is different and that there are limitations in my shape. I know that there are certain things they look for and I knew that my own comfort level wouldn’t do well at Nationals. At my lowest weight in my adult life, 122 pounds didn’t seem small at the time, but looking at the photos I can say “yep, I was tiny”. It was just about weight, I was also 12% body fat, that’s damn lean. Not lifestyle lean, but competitive lean – there is a difference and I will always remind people who have followed me for a while or those who are finding me now, that there is a huge difference. I’m currently 20 pounds above that stage weight, but only 8 pounds above my starting point. However, weight is relative – measurements tell a different story. My waist is only 1″ bigger and my hips are only 1.5″ bigger than when I started prep in January. When I think about that perspective, I don’t get as frustrated about the events that happened since April. On Facebook, I’ve mentioned the fluctuations I experienced this summer while I was figuring out a new routine, navigating stress and anxiety attacks. A couple of weeks ago I did an update about advocacy because my doctor continued to try to misdiagnose me with PCOS – which an endocrinologist determined I DON’T have. In the video, I mentioned that there was a point in July when I felt like I had a better handle on my anxiety, classes were going well and I was finding some kind of balance for the time – I literally woke up one day and just felt better. That’s when I started documenting my measurements in a notebook, I also documented weight fluctuations with notes about water intake, body feels, stressful events, sleeping patterns. For some that’s a lot of information, but a life outside of weight loss and competing when that’s what you’ve been doing for a few years is a weird life and I needed to see some of the correlations before I could make a real plan for myself. I also wanted to bring it to my appointment in August with the endocrinologist because if I was diagnosed with PCOS there wouldn’t be anything we could do except treat the symptoms, which I wasn’t interested in. Again, it was determined that I DON’T have PCOS, but having the data helped me start the new academic year off in a positive direction. September was about doing what I could since I was back to a full load of classes and that meant a lot of yoga and meditating. I started yoga in August and it’s helped mentally and physically. I’m noticing a huge difference in shoulder mobility and my lifts feel better and I’m not getting as knotted up as before. Mentally, I feel accomplished after the classes, I feel that I’m able to shut off my mind and close out the world when I’m in a practice. This is huge for anyone who is constantly on the go. At the end of September I decided to run a 5K for Thanksgiving, which meant I should probably practice more than just sprints. I run only during the work week, and I vary my running. My goal is to increase over time, which means each week I increase my distance total a little more. My goal is to be up to about 10 miles a week comfortably including sprinting and steady runs. I’ve continued to be consistent with yoga this month and plugging in lifts as they felt good – mostly just combination leg and back days. I’ve done more accessory work than ever because it’s easy to do it in the fitness center on site at our complex, but accessory work helps with the bigger lifts. I’ve decided to completely ditch my gym and save the $20 a month to workout on campus. The equipment is good, not many people attend and they have 90s on the speaker – why not take advantage of it until I graduate? After a month and half of having a more active routine that works with my lifestyle, I’m noticing some body recomposition in my legs. I measured myself for the first time in a month and my measurements and weight haven’t changed since August in the places that I’m tracking, but I’m noticing in photos I’m taking that other areas of my thigh and glutes are changing. 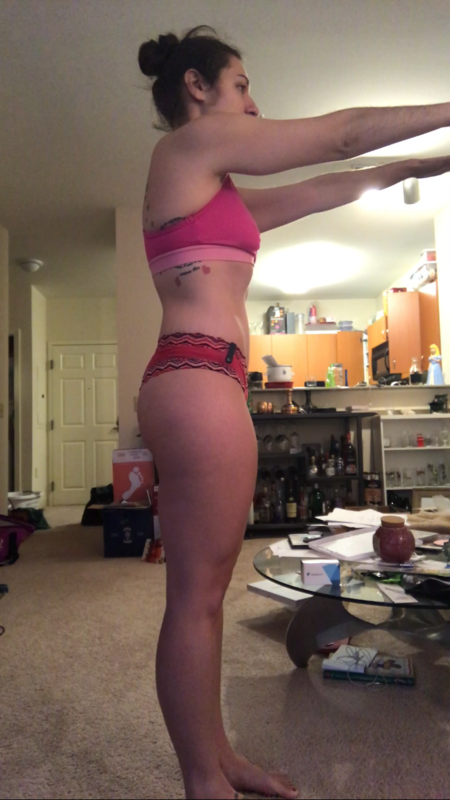 I wore a 0 to a 2 pant during prep, which again, is a tiny person, but I’m also 5’4″. This summer I was wearing a 2 to a 4 and now, I’m back to a solid 2. More importantly than these numbers, I feel comfortable in my clothes and I don’t feel like I’m tugging at them. I don’t feel bloated most days. I’ve been sleeping better (less tossing) and throughout the night with the exception of pee breaks if I drank before bed. My legs feel better in my runs. My breathing is much more steady during running, which I think is partially due to how we breathe in yoga. Mobility is increasing, especially in my shoulders and upper back, which has helped my lifts greatly. 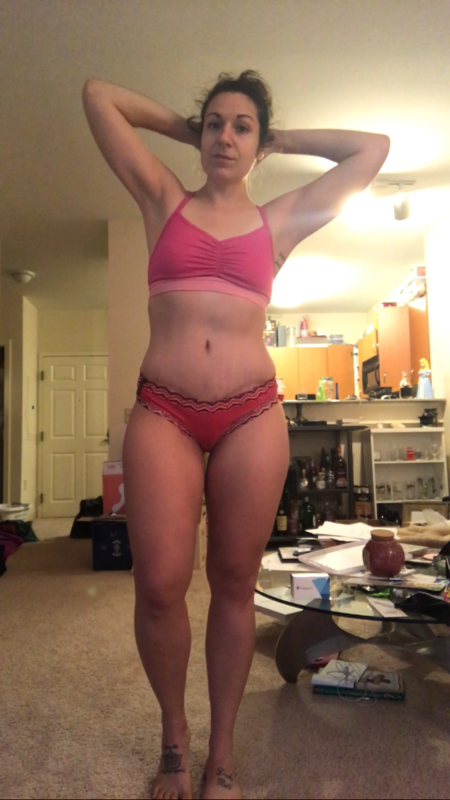 I’m able to find balance in yoga poses that I struggled with when I started in August like Warrior 3 variation and I’m able to go deeper in some of my poses. Nutritionally, I feel like I’m in a good place. Some days I eat more, some days I eat less. Some days I have too much beer and other days I have water with dinner. I track about 60% of my food because I think that there needs to be some accountability. We still meal plan and I still prep some things because it’s helpful for time and to ensure that everything is eaten and we have less waste. For those who say they’ve mastered intuitive eating, good for them, but is it really intuitive if you’ve tracked for an extended period of time and are capable of eye balling your meals accurately? Will I “ruin” my MFP streak? probably. Will it upset me? probably not. We’ve been more adventurous with our meals. I’m making pizza from scratch again tonight :] I have a pound and half of glass noodles to play with. I had a screening last night and I told her I still have days where I’ve eaten a box of Oreos and said, well I probably shouldn’t have done that. But I’m also not getting to upset about it because the action is more related to bored eating in front of the TV rather than a binging episode triggered by anxiety and stress. Still not great, but mentally, it’s better. We’re constantly learning about ourselves and that’s what keeps it interesting. Here’s a few photos I took this morning, again, not huge differences since photos in August, but I’m able to see and feel little things.